There is an ancient debate among beer geeks about "forced scarcity"--the idea that breweries do special releases of special beers in limited volume just so they can charge twice the money for it. Riffing in part on a discussion we recently had on the Beervana Podcast, Bryan Roth runs down the main points. He even uses one of my quotes from the podcast. But the most interesting part of all that was Patrick's response. Patrick is, in addition to being the co-host of the podcast, an econ professor at Oregon State. And his response was both surprising and illuminating. "The economist in me would say it's all just about the beer itself: is it good or is it bad. If it's good, even if it took you two weeks to ferment and package and you're done, that's what should determine the price. What you're saying is that the process that goes into it matters to you. Obviously the process can add to the cost, so that will drive up the price anyway. But you're more willing to pay a higher price if you know [that it cost more to produce]?" "Well, that's okay; I can understand your philosophy. And there's actually some sort-of economics in there in the sense that efficient markets require complete information. And that requires that you know what the product means to you. As an economist, it's the market that determines the price. So when you say a brewer wants to charge you this much, it's true--you put a price out there and it sells or it doesn't at that price." "What I would say is that it's clear barrel-aging imparts very distinct flavors that you can't get elsewhere. If A-B had figured out how to make a chemical and added it to a beer, then you'd have all kinds of 'barrel-aged' Bud. It imparts unique flavor characteristics and profiles that you can't get any other way and those are clearly something consumers are willing to pay for. And that's a good thing, because otherwise you wouldn't see barrel-aged beers; it just wouldn't be cost-effective. There wouldn't be any economics behind it. The market, at least now, values them [barrel-aged beers]. If there comes a time when the market gets tired of these flavors, they'll suffer." "Talking to beer people about beer prices is fascinating, because it's not really about beer markets. They take this stuff very seriously. You get into things like the morality of these prices. But to an economist it's all quite clear--there's a supply and there's a demand. So for something like Pliny the Younger, they keep the supply down and the demand huge and boom, prices skyrocket. It's the beauty of markets at work." Patrick made one final comment about the economics of pricing that is very important to consider in all of this. 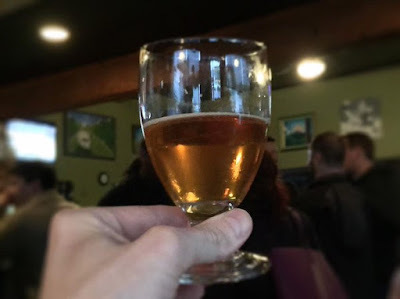 We used Pliny the Younger as the example in the podcast, and it's actually not a very good one. Something bottled like Three Floyds Dark Lord. But don't pay attention to the beer, pay attention to the principle Patrick's describing. "One of the other points I wanted to make about prices is this. You have to ration Pliny the Younger somehow. Think of different ways you could ration Pliny the Younger. You could make everyone line up three days in advance--sure, that's one way you can ration. But typically markets ration through prices. The way the market rations it is that the people who value Pliny the Younger the most are the ones who get Pliny the Younger." Food for thought. None of what Patrick says here necessarily negates the points many beer geeks make about pricing--except to say that they are not making arguments relevant to economics. Markets have an elegant simplicity about them, but as citizens we don't have to submit to their tyranny. They do ration, and we may not agree with the way they do it. In the US, the way we ration health care is by providing extremely expensive services to the people who can afford it and nothing or very little to those who can't. Other countries choose to address the rationing question differently, by offering slightly less expensive services to a wider variety of people. But I find Patrick's points of view so valuable because they clarify my own thinking. Of course, I would be horribly remiss if I didn't plug the podcast here. You can listen to this episode here, or subscribe to the podcast on iTunes or Soundcloud. And please do! In response to Patrick's comment about markets rationing by price, I would counter that there is an inherent time-sensitivity issue in selling beer. Some of the most expensive beers are at their peak when the brewery releases them. The more time they spend sitting on a shelf, the more they degrade from outstanding to merely great. So, I believe that some of the best breweries factor this time-sensitivity into their rationing model by coupling lower-than-optimal pricing with anticipation or line waiting. I understand why some beers are that expensive (emphasis in some), but, if I choose to buy them, they will still need to deliver a quality that corresponds to the price, and my experience shows that very often that is not the case. Barrel ageing is a good example. I know why it costs more, and I will not argue about that, but most of the BA beers I've had were underwhelming and, if available, I prefer their unBAed version. So, BA beers are to me, as a consumer, an overpriced product. I don't care how much they cost to make or not, I must make the same effort to earn the money to buy them, regardless, and I am not getting enough value in exchange. I never understand why some people get so upset about this kind of thing. If I'm in a room with Aretha Franklin, people would happily pay her $100 or more to sing a few songs. Me, they'd pay about three cents and only out of pity. If a great artist had a piece of paper and a pencil, people might well pay him $100 for a drawing. Me, they'd pay me a pat on the head and a smile, if I'm lucky. People have always paid for quality regardless of the cost of the inputs. As long as brewers aren't engaging in deceptive practices or using some kind of crooked dealings to shut competitors out of the market, they should be allowed to charge as much as people will pay them. It's not like they're some Nathan Myrvohld style patent troll. And quite frankly, beer prices are a bargain compared to wine -- wine lovers can easily pay $2 an ounce for good wine, while beer lovers tend to moan when they pay half that, even when the ABVs are similar. Beer is available for really high quality at quite reasonable prices, and if a particular beer isn't worth the price to a drinker, there are always excellent alternatives.